Another great street in the best borough around, Brooklyn's Pierrepont Street is a nice street with the accessibility of the metro and the rest of Brooklyn. 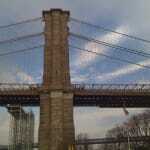 I like Brooklyn, I like the vibe, and it really has been cleaned up over the past 10 years. The awesome thing about this area is that so many music forms and great art come out of this area, so you'll never be without a show or concert! "A nice street in Brooklyn Heights"
Pierrepont Street is located in Brooklyn Heights and stretches from the Promenade on one end to Cadman Plaza on the other. It is primarily a residential street, although there are a few office buildings here and there. There are not a lot of restaurants or shops on Pierrepont, but you are just a block away from Montague Street which is lined with shops and restaurants. The subway at Borough Hall is just a short walk and the views from the Promenade are spectacular.